Banana Pecan Bread is rich and sweet, made with maple sugar. You will never believe there are no refined ingredients in this recipe. Get ready, this is going to be your new favorite banana bread! Do have you have any of those friends that are so crafty, so together that everything they touch turns to gold? Perfect decorator. Perfect crafter. Perfect DIYer. And of course everything they bake turns into bliss on a plate? My very best friend Kristine, from kristine in between is that friend. Which if you knew how not together I really am, you would wonder the basis of our wonderful friendship. Where she is polished and elegant, I am the mom in the pajama pants with the hair bun trying to remember if she brushed her teeth while dropping her kids off for school. But the truth is, she makes me laugh more than anyone I know. All of our differences make our friendship rich with stories – and keep us both from taking life too seriously. The part about everything she bakes turning to bliss on a plate is totally true. This Banana Pecan Bread is one of such creations. I had never cooked with maple sugar until this recipe. Let me say, I LOVE the maple flavor in bread. And working with granulated sugar rather than maple syrup made this really easy. 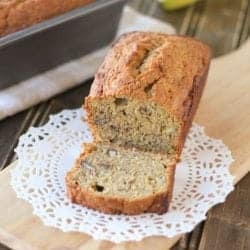 I am good and truly shocked that is has taken me this long to include a banana bread recipe on Whole Food | Real Families. I think we all have at least a dozen banana bread recipes in our rolodex. But this one is my favorite. Everyone loves it and this one is as healthy as banana bread can get. Make sure you go visit Kristine at kristine in between. In addition to being an all around domestic goddess, she is a pretty amazing photographer. You can check out some of her photos on Instagram. Looking for more banana recipes? Check out these healthy Banana Muffins! In a large bowl, cream butter and maple sugar. Stir in eggs and vanilla and mix well. Add baking powder, baking soda, and sea salt. Slowly add flour and mix until well combined. Pour batter into prepared Wilton 4 mini loaf pan or 2 regular size loaf pans. Bake 40-45 minutes until brown on the top, rotating halfway through. © kristine in between. If you wish to republish this recipe, please re-write the recipe in your own words or link back to this post. Where can I find maple sugar, or is there a recipe? Hi Aileen. You can actually find it in the regular ole’ grocery store. I find it at Kroger in the natural and organic aisle most of the time. You can also get it at places like Whole Foods, Fresh Market, etc. Let me know if you have an trouble finding it and I will source it online and drop you a link. Let me know how you like the Banana Pecan Bread!